Canada is cold, footage at 11. Regina, Saskatchewan, home of Sunday's Grey Cup, is extra-cold right now. Temperatures on Wednesday, when the Hamilton Tigercats held practice outdoors, reached 3 degrees Fahrenheit, with a wind chill (which does matter, despite what you may have read) of negative 18. 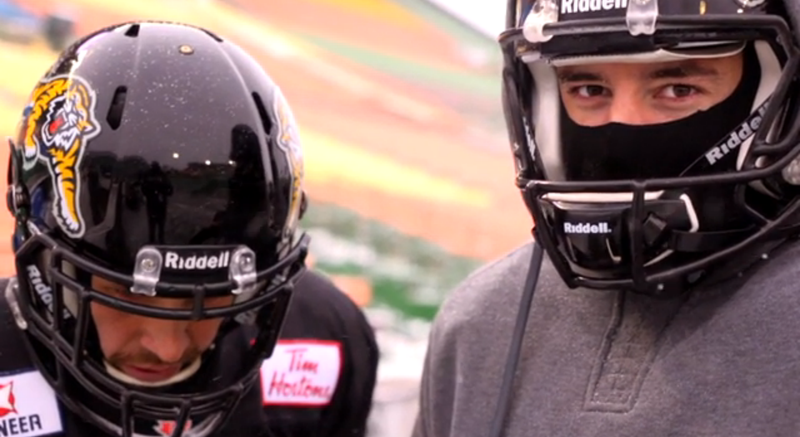 Yesterday, with both the Ticats and Saskatchewan Roughriders practicing outside, the wind chill dipped to -24 degrees. Hamilton practiced outside because coaches wanted to start getting players acclimated. It went about as well as Shackleton in the Endurance. Assistant Paul Osbaldiston said several players suffered non-serious cases of frostbite. One playbook shattered into multiple pieces. Four footballs broke from the cold. It wasn't all misery. Offensive lineman Joel Figueroa, who was born in Miami and went to The U, was excited by this whole "snow" thing. "Growing up in Miami, you see all the white Christmases on TV, everybody playing in snow and I never had the opportunity. So I kind of feel like a little kid out here." Things should be much better for kickoff. Sunday's high is forecast to be right around the freezing point. Or as they call it Canada (probably), the melting point.